Easter, the religious holiday that celebrates Jesus Christ’s resurrection from the dead is Christianity’s most important holiday. It is known as a moveable feast because it doesn’t fall on a set on specific date as most holidays do. Instead, Christian churches in the West celebrate Easter on the first Sunday following the first full moon after the vernal equinox on March 21. Therefore, Easter is observed anywhere between March 22 and April 25. This year both Easter and Passover are being celebrated this weekend. The exact origins of the word Easter is not really clear. The English historian know as the Venerable Bede (673-735) wrote that the word Easter is derived from Eostre, a Teutonic goddess of spring and fertility. Through a translation error, the term later appeared as esostarum in Old High German, which eventually became Easter in English. In Spanish, Easter is known as Pascua; in French, Paques. These words are derived from the Greek and Latin Pascha or Pasch, for Passover. Jesus’ crucifixion and resurrection occurred after he went to Jerusalem to celebrate Passover (or Pesach in Hebrew), the Jewish festival commemorating the ancient Israelites’ exodus from slavery in Egypt. Pascha eventually came to mean Easter. It seems probable that around the second century A.D., Christian missionaries seeking to convert the tribes of northern Europe noticed that the Christian holiday commemorating the resurrection of Jesus roughly coincided with the Teutonic springtime celebrations, which emphasized the triumph of life over death. Christian Easter gradually absorbed the traditional symbols. The Easter egg represents the beginning of a new life. This was symbolic of the advent of Spring which brought with it new life for flora and fauna. Easter eggs were first colored by the pagans to resemble the rising sun and announce the return of light. The northern lights were also painted on the Easter eggs. Later, an ancient Christian legend spoke of Mary giving the eggs to Roman soldiers and begging them not to kill her son. Subsequently, Easter eggs became a popular gift to give on Easter to bring luck and welfare to the family. ; though we have to admit, this did not work out to well for Mary. In Medieval Europe, eggs were forbidden during Lent. Eggs laid during that time were often boiled or otherwise preserved (pickled eggs anyone?) Eggs were prized Easter gifts for children and servants. Baby Rabbits and chicks represent the rebirth of Earth. Spring is a time when the Earth is seen as being reborn. Barren fields become lush green, trees get new foliage and flowers and fruits abound. The Easter bunny is definitely the most beloved symbol of Easter and extremely popular with children. History indicates that it may have been the hare and not the rabbit who was associated with Easter. The hare is legendary because it is believed to never close its eyes – not even to blink. Rabbits on the other hand are born blind. Hares were thought to be staring at the full moon all through the night. 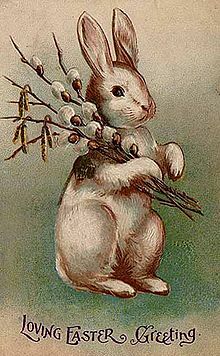 The hare was also a symbol of fertility linked to the Greek goddess of fertility Eostre. However I am sure we all agree, rabbits are more fertile than hare and far more prolific reproducers, and much more cute. The white lily is thought to be as pure as Christ and a symbol of the purity of the new life that comes from being resurrected. Here in the West we call these peace Lilies because, let’s be honest, the name Jesus Lily would only sell to a certain market share. Early Spring is a time of renewal and is sacred to almost all religions. I love this time of year because it is a time of renewal and new hope. Spring fever has hit, and now that the snow is gone I am ready for change. I am all for renewal; Spring Cleaning comes to mind. Tomorrow I will start cleaning out my garden patches to get ready for my herbs and veggies. This year I am going to try to plant a Medieval garden. Whichever holiday you are celebrating I want to wish you all the very best, and a wonderful new Spring renewal. Generally I do not learn article on blogs, however I would like to say that this write-up very forced me to take a look at and do it! Your writing taste has been surprised me. Thank you, very nice post. I do not even know the way I finished up right here, but I thought this submit was once great. I don’t understand who you are but certainly you’re going to a well-known blogger if you happen to are not already. Cheers! You can certainly see your expertise within the paintings you write. The sector hopes for even more passionate writers such as you who aren’t afraid to mention how they believe. At all times go after your heart. Great issues altogether, you simply received a new reader. What could you suggest about your publish that you simply made some days in the past? Any sure? gabriel I ought to say, as a whole lot as I enjoyed reading what you had to say, I couldnt assist but lose interest following a even though. Its as should you had a great grasp on the topic matter. I just happened to stumble across your website and the write up Easter Symbols and Spring Renewal The View From Sari's World. The essay you provide kind of causes me think. Thanks for sharing.